Relish Sunfeast YiPPee! 's long, non-sticky and safe noodles with oodles of special flavours from a special recipe created by ITC just for you. Enjoy the delicious blend of unique spices and five different types of dehydrated vegetables in a forkful of Sunfeast YiPPee! 's Magic Masala. It's truly magical in taste! So go on and dig in! We are engaged in offering Sunfeast Yippee Noodles. We are a top notch supplier of Sunfeast Yippee Noodles. Relying on our expertise in this domain, we are into offering Healthy Noodle. Our company has been successful in winning appreciation from the clients as one of the most prominent names in the trading of Sunfeast Yippee Noodles. 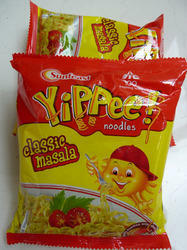 The instant noodles segment brings to you Sunfeast Yippee Noodles Classic Masala. Easy to make and tasty to eat, it makes a great breakfast meal for those pressed for time. Even as an evening snack, mothers find it convenient to make it for their children. This round noodle block is truly delightful.